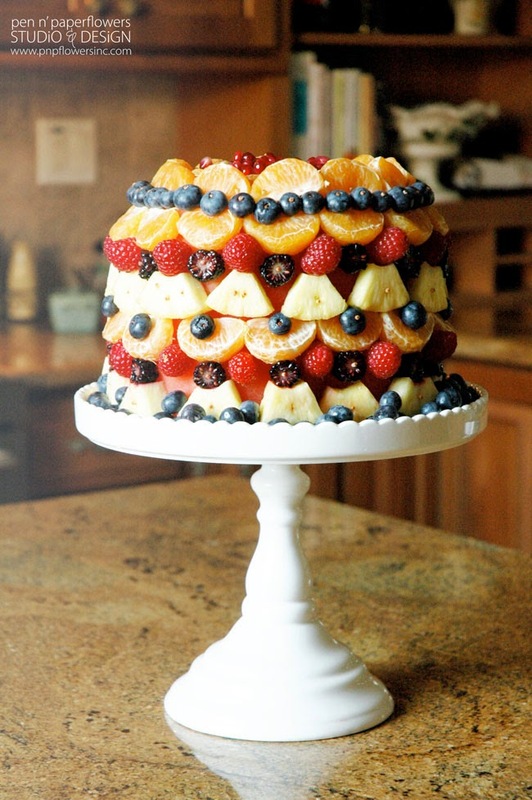 It's "Fresh Fruit Cake" time around here again! Yep! Ema asked for her favorite birthday cake for the THIRD year in a row. She actually asked to help make it instead of letting me surprise her with it. She gushes about how much she loves this cake every year and this birthday was no different. We still used a watermelon as the base and much of the same fruits but we did add tangerines and pomegranates (one of Ema's favorites) this year. I think it's the prettiest cake yet. We're getting pretty good at this, don't you think? 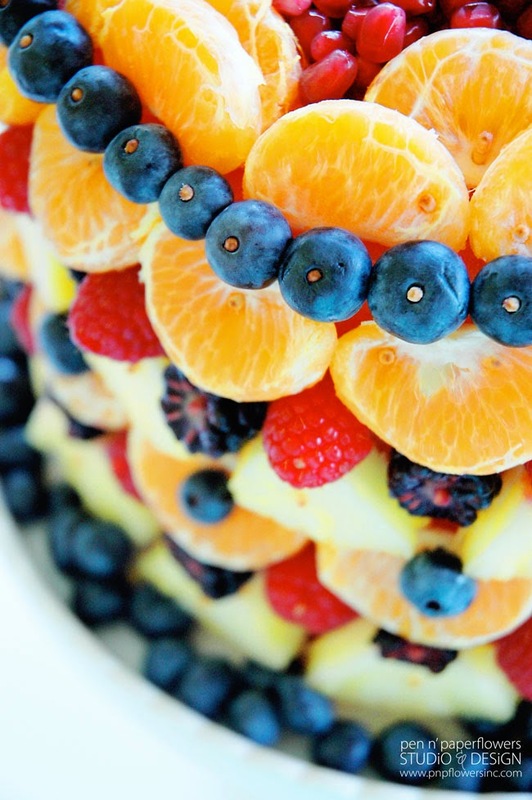 It's seriously the best cake ever (unless you absolutely don't like fruit), because this cake can be eaten by anyone. There are no added preservatives. People with food sensitivies or allergies are good to go. Family members who are watching their weight will be relieved there isn't a big ole tempting sugar-laden cake staring back at them. Parents who are tired of feeding their kids refined sugar or are avoiding HFCS will love you. And those health fanatics avoiding sugar, wheat, gluten or dairy just may choose this for their own birthday cake…you watch! 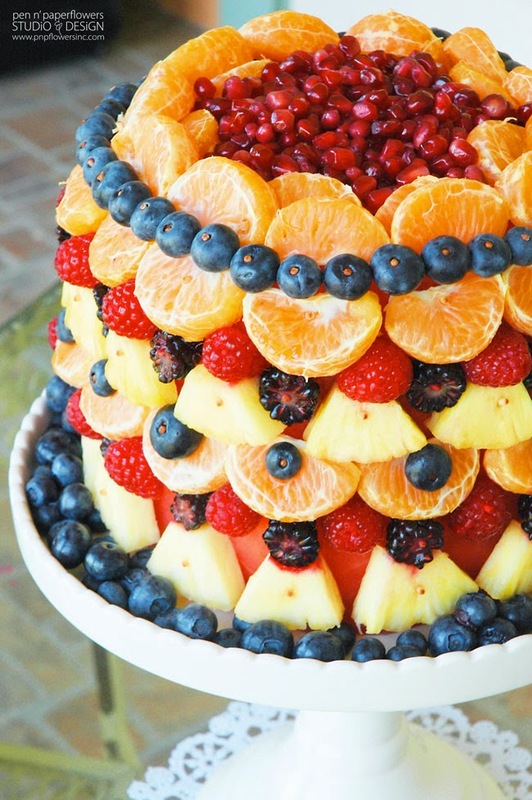 All you need is some fresh fruit, toothpicks and an imagination and you've got yourself the healthiest cake on the planet. If you are thinking it's going to be difficult to slice with all of those hidden toothpicks - it's actually surprisingly easy. Just use a long sharp knife and cut it just as you would a traditional birthday cake…in slices. When you serve the slices the toothpicks should be removed prior to eating - especially before you serve it to young children. Now…I have seen some people slather their fresh fruit cakes with cool whip so the watermelon is hidden underneath and it resembles an iced cake. 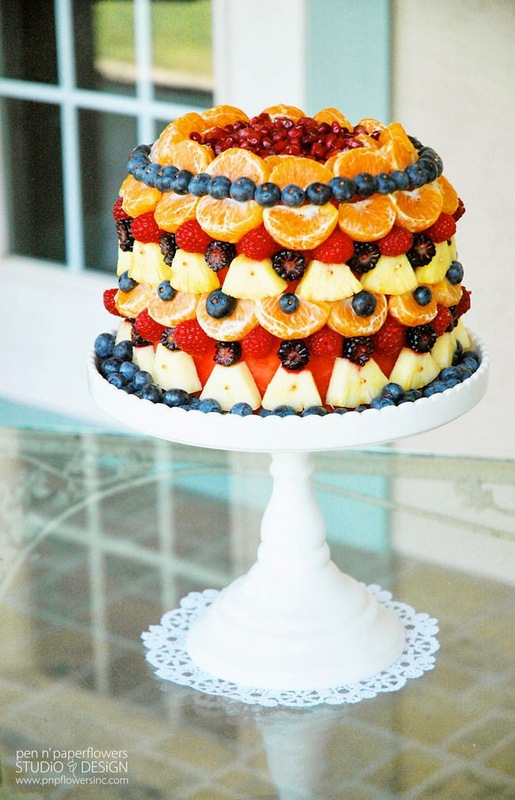 However, Ema's whole goal in her original request for fresh fruit as a birthday dessert is to keep things healthy - why ruin a perfectly healthy cake? 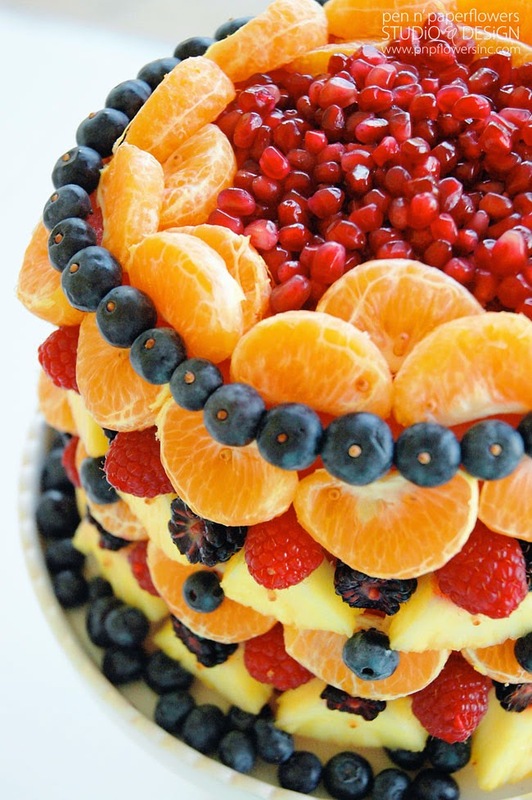 See the step-by-step process from THIS POST on how to create a Fresh Fruit Cake. Making a fresh fruit cake is NOT cheap. But you could do a mini-sized version by selecting a smaller watermelon as the base and only adding a few different fruits. Now…I'm off to dig my toes in the sand at the beach with all three of my girls! Looks like it's going to be the only halfway sunny day this entire week so I'm planning on making the most of it! Pssst…Ema has already taken (and passed) the test to be given her Learners Permit so we'll be heading up there on Friday for her to have her photo taken and to make things official! (I can't believe she is 15). Craziness!